A well-lit front entrance says, “Welcome.” It enables you to greet guests and identify visitors. Be sure that your light output correctly corresponds to your front-entrance environment. If it’s too dim, guests may stumble; if it’s too bright, guests will be blinded. Outdoor wall lights on each side of the front door will give your home a warm look, while also ensuring the safety of those who enter. Also, consider adding a lighted address fixture; you’ll never be without a comforting light to greet you. Pro tip: Select a pocket-light design, which casts a warm glow on stone and other unique building materials. Ensure safe and easy movement after dark by illuminating the yard, driveway and walking areas with post-mounted lanterns. They add security and safety, as well as beauty and value, to your home. Pro tip: Open-bottom designs make for easy access when cleaning and changing bulbs. 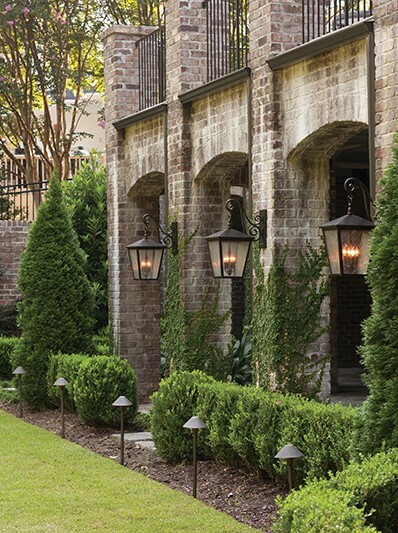 Create a dramatic effect by up-lighting trees with well lights recessed in the ground. Use flood and accent lights to illuminate the walls of your home or create silhouettes of unique topiaries. Pro tip: Cast aluminum resists sun-induced corrosion, fading, chipping and peeling. Visit Ferguson Bath, Kitchen and Lighting Gallery to speak to a product expert and begin selecting the perfect fixtures for your project. Many showrooms have a certified lighting expert on site to assist with product selections and offer world-class customer service. They will work one-on-one with you to create custom lighting plans for any space. For more information and inspiration, visit your local showroom or FergusonShowrooms.com/Inspiration.